Matt Smith appeared on Craig Ferguson’s show on July 24. Video above. And what about the biggest dangling plotline in Doctor Who history? Back in 1986, the Doctor met a dark alternate future version of himself known as the Valeyard, who put him on trial and tried to steal his remaining lives. And the Valeyard was never mentioned again — until the most recent Who story, “The Name of the Doctor,” when his name came up. Well, I couldn’t resist saying ‘The Valeyard,’ because we haven’t mentioned him in the new series. [Laughs] So I thought, ‘I’ll just put that one in.’ I never quite understood, in ‘Trial of a Time Lord,’ what he was meant to be. I never understood if he was a real Doctor, or [something else]. But in a story where we are hinting that the Doctor has a hidden chapter to his life, it was irresistible to mention the Valeyard. But you know, he’ll only ever get so dark, let’s be honest. He’s the Doctor. I think a man who worries about going bad is never really going to go bad. Maybe not. As for the Doctor’s wife, River Song, she is not a dangling plot any longer — and in fact Moffat seems pretty happy with how he left her in “The Name of the Doctor.” At this point, he seems to feel as though he’s told the story he wanted to tell about her. It doesn’t sound from this that the theories of the John Hurt Doctor being the Valeyard are correct, but this could also be misdirection on Moffat’s part. There are also rumors that a scene is being filmed showing the regeneration from Paul McGann’s Doctor to John Hurt’s Doctor, which might be shown as a prequel. AVC: This is a prequel to stories we’ve already seen, and you’ve been very open about your plan for the series going forward. How do you keep the suspense? How do you keep overriding tension when we know where this is going? BF: Well, we know that Hannibal is going to get caught and that he’s going to end up in the Baltimore State Hospital For The Criminally Insane, but a lot can happen to get there. I think the big move in there was to frame Will Graham and have him take the fall for a lot of these murders, which, right off the bat, introduced a completely new concept to the backstory, but also gave us a way to hold off incarcerating Hannibal Lecter for a while, because we have such a new twist to the story, where Jack Crawford is going to be bonding more with Hannibal Lecter, which really informs his distrust and disdain for this character when we get to the Silence Of The Lambs or Red Dragon era of the story. So it felt like we have now all of this opportunity to tell the specific details of a story that only existed between the lines of the book. AVC: This episode really starts the relationship with Will and Hannibal together in therapy. You’re really interested in both presenting Hannibal as a credible therapist and in the process of seeing two people in a room talking together, which is different for a crime procedural. How did those two elements come to enter the show’s world? BF: Well, there’s a certain amount of budgetary restraints with the show, because we are not a big-budget show. In the path we had gone down initially, we laid out a version of the show for the network, and the network said that it wanted it to be much more case oriented and procedural. So we laid out that version of the show, and it was very, very expensive. And nobody wanted to increase the budget, so it was really a matter of going back to… fortunately the budget was our friend in that way, because I did want to tell a psychological horror story, and I didn’t want to spend a lot of time at crime scenes when I could be finding out what characters are going through. And the best, simplest way for that was for people to sit down and talk about it. We fortunately are dealing with psychiatrists, so [Laughs.] it’s a great platform to have people say what they mean and what they feel and have it feel relatively natural, given the context of where they’re having those conversations. So it was initially a budgetary thing, but I think for the benefit of the show—and the stories I was interested in telling—were much more psychological and could sustain sitting down and talking about them. Before I was going to be a writer, I was going to be a psychiatrist, so I’m fascinated with psychiatry and how it can go wrong and how it can be incredibly helpful for the patient. So I thought it was a great opportunity to tell a story about psychiatrists. And we have a lot of psychiatrist characters on the show. [Laughs.] It felt like that’s our world and these are our characters, so they are going to be talking about psychiatry. And we tried to get the psychiatry to be as honest as possible, given what we needed to tell, story-wise. AVC: Will she be able to be in future seasons? She has a new show at midseason on NBC. BF: We absolutely want her to be. She absolutely wants to be. It’s going to be working out the schedule with the other show, and we know that it’s about the schedule. We were very flexible with her last year. Actually, she was in five episodes, and we filmed all of her material over three days. We got her for three days, got her in, did the five episodes, and got her out, because she has a family in London that she wants to spend time with. She’s very interested in coming back. Right now, she’s in the first episode of the second season, but we have to work out schedules and see if we can actually pull it off. AVC: This episode brings Abigail’s arc to an end. Was she always going to die? BF: We made that decision about halfway through the season. She wasn’t always going to die. It was one of those where we were going to kill off one of the regular characters, and the character that we were going to kill off, we felt like it wouldn’t be as devastating for that person to die, because we hadn’t fully serviced that character. Someone had said, “I don’t really care about that character dying, but if you’re going to kill somebody that’s going to make me upset, then Abigail Hobbs,” and I was like, “Yeah, that’s who we have to kill, isn’t it?” [Laughs.] It’s kind of as simple as, “Whose death would mean the most?” and it was Abigail’s. AVC: Can you reveal who you were originally going to kill? BF: No. Because we may kill them in the second season. AVC: How important to you was it that he have that moment of realization somewhere in this season? BF: Very important. Because the audience knows from the first frame, before Hannibal is even onscreen that we are telling the story of Hannibal Lecter, who is going to be caught by Will Graham and incarcerated, Will had to figure Hannibal out in the first season. Otherwise, it would feel like we were treading water and artificially distending the story to accommodate a television schedule, and I wanted each of these seasons to feel like a novel, as opposed to episodic television. It felt like, what a great way to begin the story and then end the story at that point. And end it iconographically with the Silence Of The Lambs shot of coming down the corridor of the Baltimore State Hospital For The Criminally Insane, to that last cell on the left and finding, not Hannibal Lecter, but Will Graham. And know that we are now taking a turn away from the canon that will somehow get us back into canon. But right now, we are departing from the literature into uncharted territory that will be unique to the television show. Then when we circle back into the timeline of the books and get to Red Dragon again, so much will have happened between these characters that will further inform their uniqueness to this show. AVC: Will is incarcerated right now, and if you’re able to go on and do the later seasons, Hannibal will be incarcerated. How do you approach that question of writing a character who’s confined to a room, yet has to be one of the protagonists of the series? BF: That’s the great thing about imagination is that Will’s imagination can transport him out of that room and into places, cinematically, that will allow him to continue being a pivotal part of the story, even though he’s locked up. One of the things that was really interesting in the books, is the concept of Hannibal’s memory palace, the place where he goes to survive incarceration with the virtual-reality system that exists between his ears. We’ll be seeing Will create his own version of the mind palace over the course of the second season. 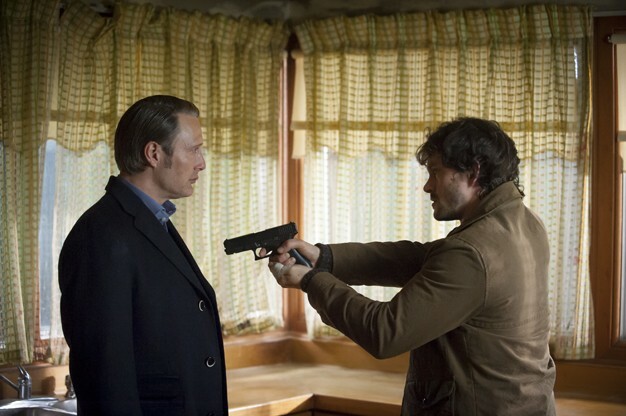 AVC: How intricately did you think out Hannibal’s framing of Will? BF: It was pretty meticulously plotted. We knew that there were certain changes along the way, like we were originally going to deal with both the copycat killer and the Chesapeake Ripper in the first season, and then it felt like, as we got further into this season, that the story should be about the copycat killer primarily, and that the Chesapeake Ripper should serve to complicate Jack Crawford’s character. Then we could spike that ball in the second season. Vulture outlines what we know, and what is being rumored, about the next Avengers movie, Age of Ultron. The story won’t be based upon the recent comic arc with this name, and there will be a new origin story. Quicksilver and the Scarlet Witch will be joining The Avengers. Joss Whedon also says that Black Widow will have a larger role in this movie. Under the Dome was disappointing last week (with the entire series so far not living up to my hopes for it). Did anyone really doubt that the mother of all bombs would hit the dome and nothing would happen inside? I could see where the inhabitants would be worried, but I would expect them to see the failure of the bomb to affect the dome as a possible outcome. I was not surprised to see Big Jim question whether to release Angie, and not all that surprised to see her back with Junior. The Hollywood Reporter conducted an interview with producer Brian K. Vaughan which answers some minor questions. But it sounds like the Tarr Family will be the major source of drama for Season Two. Murphy expressed that they are what he’s looking forward to the most, having left them in a precarious position at the end of season one after Datak was arrested after winning the election, leaving the Tarrs broken. He will be missing in the beginning of the season (as will be Irisa). Amy Sherman-Palladino’s show Bunheads has officially been canceled.David Weigel had previously called the best show on television. I wouldn’t go that far, but nobody other than Aaron Sorkin can write better dialog than her when she is hot. Unfortunately the show didn’t last long enough to rival Gilmore Girls. John Williams is going to score the next three Star Wars movies. They wouldn’t be the same without his music . Netflix is rapidly turning into a major source for new television material. Arrested Developmentwill return for another season. Netflix has also renewed Orange Is The New Black. It appears that HBO will be renewingThe Newsroom, perhaps with an official announcement coming soon. It is looking like Rosamund Pike and Ben Affleck will be playing the leads in the movie adaptation of Gone Girl. J.K. Rowling says a sequel to Cuckoo’s Calling should be out next year.